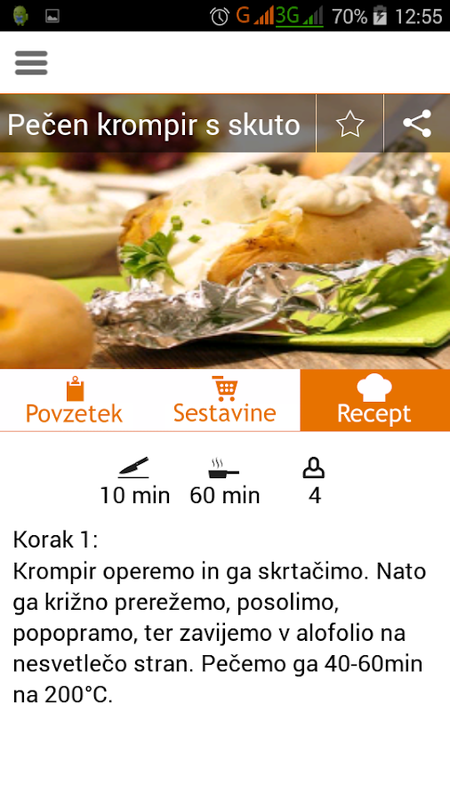 Kulinarična aplikacija z recepti za vse okuse. Aplikacija vsebujerecepte novejših in domačih jedi. Kuharski recepti so v slovenskemjeziku. Za uporabo aplikacije ne potrebujete interneta, tako dalahko kjerkoli preverite kaj vam doma manjka za kuho izbrane jedi.Trudimo se, da bo receptov vedno več. Prijetno kuhanje!Jedi sorazdlejene na pet skupin, Glavne jedi, Predjedi, Priloge, Solate inOmake.Recept, ki vam je všeč lahko delite prijateljem ali pa si gashranite med priljubljene.Prispevate lahko tudi vaš recept!Culinaryapp with recipes for all tastes. The application contains a newerrecipes and homemade dishes. Recipes in the Slovenian language. Touse the internet you do not need, so that you can check anywhere inyour home is not something cooking chosen dishes. We are trying tobe more and more recipes. Pleasant cooking!Dishes are razdlejeneinto five groups, main dishes, appetizers, Annex, salads andsauces.The recipe that you like, you can share to your friends oryou can save it to your favorites.You can also contribute yourrecipe! Klasična igra spomin namenjena tako odraslim kot otrokom. Osnovnoiskanje parov v 4 različnih kategorijah s šaljivimi slikami: sadje,zelenjava, poletje in živali. Igra si zapomni vaš najnovejširezultat in rekord, ki ga lahko vedno izboljšate!The classic memorygame designed to both adults and kids. Basic search couples in 4different categories with frolicking images: fruits, vegetables,summer and animals. The game remembers your most recent score andrecord that you can always improve! A Breakout style game with candy bricks in which you must destroyall of the candy's. Keep the ball in play and catch powerups bydirecting the paddle with your finger.Can you beat your own record? Your mission is to pick up as many astronauts as you can! But watchfor space rocks! Collection of best and various types of Indian Recipes In HindiLanguage.The app contains the various Indian food stuffs across andare broadly classified as per the taste of every person as perregion, festivals and all the types of requirements. Consistency isfulfilling and would be a healthy experience for all the users.Thisapp gives you each Recipes in Hindi only. It is a very useful Appfor cooking lovers as well as new cooking Learner also.This appwill use in your kitchen at any time.Do with this app :1. See allrecipes categories wise,2. Recipes in detail view.3. Share withOther friends and family by social network4. Favourite anyrecipes.App have Following Categories :* Panjabhi Recipes* Nashta(Breakfast) Recipes* Paratha Recipes* Sabji Recipes* Fast Recipes*Chatani Recipes* Achar Recipe* Gujarati Recipes* Bengali Recipes*Veg and Non Veg Biryani Recipes* Festival Recipes* Salad Recipes*Non-Veg Recipes* Baby Food Recipes* Sambar Recipes* South IndianRecipes* Ice Cream Recipes* Roti Recipes* Mithai Recipes* SoupRecipesFeatures of This App :* 100% free application* Beautifuluser friendly interface* Add your favourite recipe in favouritelist. * Offline App so does not require internet connection. * ShareTips with all social media appsThanks in Advance for Downloading.Rate Us if you like So much. Recipe book is a completely free app that brings you millions ofvariety recipes. We provide you only healthy and delicious recipes.If you are a beginner in cooking then this free app will be thebest companion for you. Step by step instructions for cooking isprovided.Recipes from different parts of the world. You can try newdelicious,tasty and healthy recipes. Even kids can prepare theirfavorite recipes without anyone's help. Recipes like healthy,salad, vegetarian, dessert, cake, pizza, barbecue, low calorie,burger, diabetic, egg, fish, chicken, ice cream, beverages, bread,breakfast, dinner, slow cooker, gluten free etc all integrated in asingle free app. We have special categories for festivalrecipes,holiday recipes like Christmas recipes,New year, Eid,Thanksgiving, Fathers day, mothers day recipes, children's dayrecipes, Halloween etc. Native language is supported. You can viewrecipes in your own native languages. Recipes that available onlyin famous restaurants can now cook in your kitchen. Take this freerecipe app to kitchen and start cooking. This will be the best andperfect recipe app for you. Explore the largest collection ofhealthy recipes. Indian recipes, Mexican, Korean, Chinese,Japanese, German and more. You can get your favorite recipe bysearching the recipe name, ingredients etc. You can access recipeswithout the aid of internet by adding them into offline. You canbookmark your favorite recipes too. You can add ingredients toshopping list so that you can buy it from the market very easily.Our extensive library of recipes highlights the many diversecuisines of World. App features: Global search Search recipes byingredients, names, tags Shopping list Recipe preparation timeOffline recipe access Favorite recipes can be stored separatelyReverse recipe search Recipes can be shared to anyone by a singleclick Recipes are provided with their nutritional value, caloriesNumber of servings is also provided Recipe of the moment Pizzarecipes have more demand in all countries. Chinese noodles andfried rice is more tasty. People always searches for healthy foodswith more taste. This free recipe app provides diet planningrecipes. Food calories is must needed. We have added calorie ofeach recipes. Nutritional information is also provided. Diseaseslike scurvy, obesity, or osteoporosis, diabetes, cardiovasculardiseases etc can occur due to improper foods. All these can beavoided by taking healthy food habits. Diabetics can be controlledby taking diabetic recipes. You can cook delicious recipes veryeasily. Easy and quick recipes are there for cooking. Paleorecipes, pancake recipe, salsa recipe, carrot cake recipe, eggplantrecipes etc. There are baby cook specially for babies. Weightwatchers cookbook will surely have some good healthy salad recipes.Healthy salad recipes can be given for heart and diabetic patients.This app is free for all time. Download this perfect app and startcooking variety dishes. Happy Cooking !! Time to release the chef inside you...Order Up!! To Go is adelicious blend of frantic kitchen cooking and restaurant empirebuilding. Chop, roll, slice, and dice your way to culinary stardom.Optimized specially for Android, featuring perfect controls andcomic kitchen action, this is one time management game that willkeep you busy for hours.• RESTAURANT EMPIRECook your way across avariety of restaurants, each with their own menus to unlock andmaster. Put your culinary skills to the test as the challenge rampsup!• ARE YOU A NATURAL IN THE KITCHEN?Use the perfectly designedgesture controls to prepare and cook your recipes. Flick burgers inthe air, carefully chop your veg and drop fries into the fryer allwith the touch of a finger!• PERFECT GAMING RECIPEAs well aschopping, slicing, flipping and frying you will also have to keepyour kitchen in ship shape. Fight off fires, rat invasions and evenhealth inspectors. • A WORKER IS ONLY AS GOOD AS HIS TOOLSAs youplay through the game, upgrade your restaurants with new, betterequipment. Purchase up to 6 restaurants in game, each with its ownunique cuisine! Now we happily release Foodiest for global users having interest incooking or eating delicious dishes. Foodiest is full of video andgif recipes whetting appetite and never allowing your mouth to stopdrooling. We are keen to please your mouth and eyes with awesomefood recipes. Especially people who are interested in Korean Food,download our application, and experience now! What do we have inour application?- gif and video recipes for world cuisines as wellas K-food- easy and simple cooking directions- personal foodrecommendation based on dietary preference- user community for allfoodies, who wish to share their cooking stories and daily lifeIfyou just have an appetite for yummy dishes and wish to cook, eventhough you are clumsy at cooking, you are fully ready to enjoy ourfoodtopia @ Foodiest. With Foodiest, you don’t have to worry aboutwhat to eat or how to cook every day. We pick the best food andrecipes for you based on your dietary preferences. Feel thewonderful changes in your eating life!Score our application andfeel free to contact us to share your ideas or opinions about it ifyou have any. We have big ears to listen to your voices. Welcome toour Foodtopia! App content is in hindi language. Different types of recipes havebeen included like sweet dishes, vegetable, vegetarian, low calorieetc. Cooking procedure and ingredients of each recipe has beengiven. The ways of serving recipes and giving final touch to therecipe has also been described. Users can also share recipesthrough social networking application like Hike, whatsapp, Lineetc. Egg recipes free app is a perfectly designed cookbook that containsvariety of egg recipes from different parts of the world. This appis completely free for all time. Egg recipes are loved by all. Allrecipes from this app are completely healthy and delicious. Theirare millions of variety of egg recipes. Eggs are the most cheaplyavailable foods which are also a fast to cook dish. These arenaturally produced food containing many essential nutrients. Somost of them are healthy. Diabetic patients mainly preferred tochoose egg recipes in their food menu. All are easy to cook.Quickly made egg recipes are also available. You will get any typeof food which you are loving to cook from this app. Recipes can besearched by using recipe name or ingredients. App categoriesincludes : breakfast burritos breakfast pizza breakfast quichebreakfast sandwiches breakfast strata frittata omelets scrambledeggs breakfast casseroles breakfast quiche french toast Scrambledwith Chipped Beef Scrambled with Lettuce Scrambled with Shrimpswith Fresh Tomatoes with Rice and Tomato with Asparagus Tips EggFlip Omelet with Asparagus Tips with Green Peas Havana with TomatoSauce and lots more. Eggs always contains high value of nutritionand vitamins. Different countries like India,Mexican,Korea,Germany,Cuba,Thailand,America,Brazil,Portuguese etc havetheir own special egg recipes. Egg recipes can be great any time ofthe day, find some delightful ideas including pancakes, a perfectaioli and a poached eggs recipe. Hard-boiled eggs are a great wayto add a little protein and vitamin D to your day. Eat them plainor enjoy them in one of these egg-cellent recipes. Recipes can beadded to offline collection so that they can even access withoutinternet. Your most loved recipes can be added to favorites. Nativelanguage support is an extra feature of this app. You can share thejoy of cooking with your friends,relatives,families etc by a singleclick. 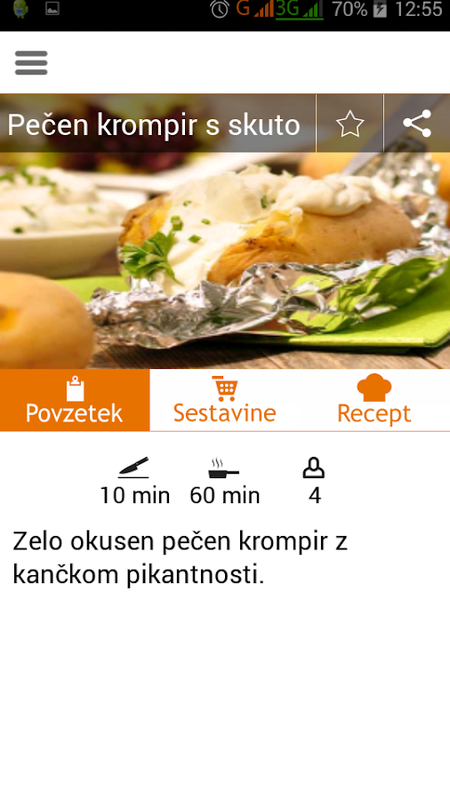 App Features: Advanced search Favorites Offline CollectionRecipe Sharing Today's Recipe Nutritional facts Native languagesupport Authentic delicious Egg recipes from various regions ofworld. A perfectly designed cookbook which you can get all yourfavorite Egg recipes. Start downloading and enjoy cooking deliciousand healthy egg recipes!! Happy Cooking !! Italian Recipes app offers you many easy, delicious and tastyrecipes. These include stews, soups, desserts, drinks, salads, sidedish, main course and appetizers. Popular recipes of the monthRecipes with mozzarella and parmesan cheese, italian dressing,olive garden italian dressing, shrimp scampi, spaghetti andmeatballs, Italian lemon cookies, Italian family pizza, hot italiansausage recipes, fettuccine alfredo, caesar salad, garlic bread andrainbow cookies are popular in July. Simple recipe instructionswith picture Every italian recipe has easy step by stepinstructions with a photo. Collect favourite recipes Add yourfavourite Italian recipes to the app's favourites section. You canuse the saved recipes offline. You can also create Italian recipecollections on the basis of weekend party ideas, breakfast ideas,lunch ideas, cooking and prep time, cooking style etc. Grocery listor Shopping list You can add ingredients from a recipe into theshopping list. All Italian recipes come with a recipe converter tohelp you change recipe servings. Italian Recipes app automaticallychanges ingredient quantities based on your serving size. Recipesearch Find recipes by simple search with the name of a recipe orby ingredients used. You can search for Italian recipes withingredients you have in the kitchen or refrigerator. Tastes,allergies and diets We often have Italian recipes for peoplefollowing paleo, keto, vegetarian and gluten-free diets. If you'resuffering from any food allergies, we have egg-free, lactose-free,wheat-free, seafood-free and peanut- free. Nutritional informationlike cholesterol, fat, carbs and calories are available in theItalian Recipes app. Create Meal plans Meal planning is going to bequick and easy with Italian Recipes. Start eating Italian recipeswith proper meal planning and grocery shopping. We offer lots ofItalian recipes: Cook tasty Italian recipes at home using porcinimushrooms, anchovies, beef & chicken. Recipes for classicItalian dishes like pizza, baked penne with sausage and creamyricotta, Italian soda, classic chicken parmigiana, spaghetti withclams and garlic and eggplant parm are available in the app. Ourfavourite Italian recipes include pasta bolognese,spinach-and-sausage-stuffed peppers, lemon-honey semifreddo,italian fiesta pizza and chicken parmesan heros.Start cookingtoday.